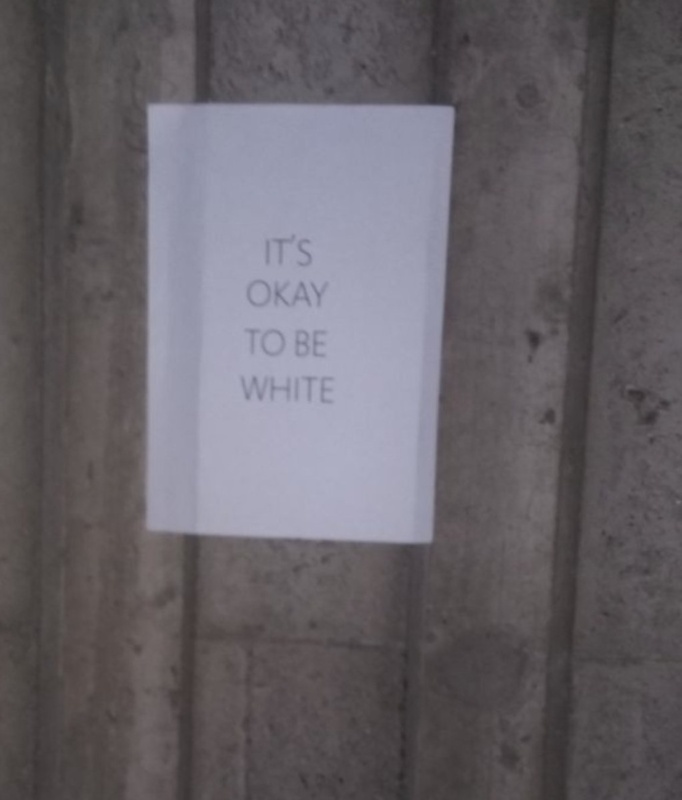 Posters reading, "It's okay to be white," like this one in Seattle, were hung in locations across the country during the first week of November. Multiple posters that said, “It’s okay to be white,” were found on Sunday and Monday at the University of Utah. In response, the U’s Office of Equity and Diversity posted a statement on Facebook condemning the posters Monday. “This appears to be part of a nationwide campaign with the purpose to create division throughout our campus community,” the post said. The office pledged to continue to work toward its goal of equality and inclusivity on campus. Flyers with the same message have been posted at colleges and high schools across the country. The Washington Post reported that the posters may be the result of a campaign started on the online chat site 4chan last week. The U has specific guidelines for campus postings, including obtaining approval from university officials, which is indicated by an expiration date stamped onto the poster. The posters found on Sunday and Monday were not approved by the U and were subsequently taken down. Nelson also stressed the importance of reporting incidences of discrimination to the proper authorities. “If someone on campus witnesses discrimination or feels discriminated against, they should report the incident to the U’s Office for Equal Opportunity and Affirmative Action or the Office for Inclusive Excellence, so the incident can be investigated and addressed,” he said. The release said one of its goals is to identify what the school can do to make the U a place where students from all backgrounds can find success. Those who feel they have experienced a bias incident or hate crime at the U may report the incident directly to campus police at 801-585-2677 or through an online form. “Creating a culture of inclusion, in which all members of our campus feel welcomed, is incredibly important to us, and we look forward to the recommendations from the task force as we work to improve,” Nelson said. Those are not typos, they’re intentional. There is a difference between those two terms and the usage of “equity” is very much an intentional act. So these posters are offensive? And meant to cause division? I hope no one thinks that. You may want to learn more about inclusion and racial discrimination based on US history and how the poster can be seen as a jab or a division. Good thing you’re in college and can find courses to help you become more informed. Right? I’m pretty sure this is more about not excusing the demonization of white people than hate speech against non-whites. They definitely are meant to cause division. If you don’t believe me, then the alt-right…gentleman…that proposed the movement has officially played you for a fool. Read about the posters and tell me they weren’t meant to cause division. And to be clear, the message of the posters is not the words written on it. The blogger who conceived this knew damn well that the seemingly innocuous words hid his true, intentionally divisive, message. Does anybody know how “It’s okay to be white” is controversial? It just seems like another slogan pointing out the obvious, just like “black lives matter.” Unless it’s the slogan for some sort of insidious cause that goes beyond the slogan, I fail to understand how the statement attacks diversity and inclusion. What kind of things were the people on 4chan saying? It’s because no one has ever questioned the idea that, say, life in general matters. But the mere fact that we continue to ignore the everyday atrocities committed against minorities is deplorable, itself. And to then co-opt their suffering is an act of aggression. It’s kind of like actively seeking attention for a crappy breakfast you had once when people are trying to help pay medical bills for the neighborhood kid with leukemia. In essence, not cool. If they said “It’s okay to be black.” They would be praised. Seriously. This is exactly how I read this article. Where is it not okay to be white? When has our government or school shown that through their actions? What I’m getting from this is that the affirmative action office is asking people to report the affirmative action office to the affirmative action office for being racist by decrying these signs. If there were a like button I would click it on your post James. The fact that a full article was written by the University claiming the phrase “It’s okay to be white” is racist, tells me that this university does not believe that it is okay to be white. I am soooo glad I am almost graduated! I will definitely not be donating to this university in future years. Is it okay to be white though? I️ mean the school instantly condemns the posters. I️ am called “racist” and “sexist” just for being a white man. In the search for equality we are treating white people with the disdain that other races are protesting. Must we always belittle someone? Why did I️ not receive scholarships when I️ out performed my diverse classmates? Why did I️ have to start working to support my family when I️ was 12 years old, and begin full-time work as a 15 year old if I️ wanted any hope of going to college? Why is it more difficult for me to get promotions, scholarships, and leadership positions when I️ was statistically the better choice? Maybe there are some white people out there who are privileged and entitled, but I’m not one. And yet my entire race and gender are treated like the children of billionaires. “Equality” doesn’t seem so equal from my point of view. Good thing the article left an online form and phone number for you to report all these incidents to them. We need to start making changes because equality truly doesn’t seem equal when you bring up valid points. But before you do that, I’ll just give you a heads up that they might ask how you “out perform” your diverse classmates. They might ask you to back up how you are “statistically the better choice.” Did people really say you’re the best, but they decided to give it to your inferiors? Because if I evaluate myself on promotions, scholarships, and leadership positions, I’m always the best choice. That’s probably why they don’t let me decide my own final grades in class based on self evaluation. Of course that’s just my opinion. I’m probably wrong and you are probably correct. You are rightfully entitled to those things you listed. I agree with you. This trend among the contemporary left is just as bad as the teapartiers were. It’s like the left’s version of the tea party. It’s irrational and emotionally based. It’s left wing populism and it doesn’t even make sense. And the last place for anything irrational and not based in reason is a University. Yet here we are because we have to pander to this nonsense for some reason. I feel you, Eric, I too was brought up in abject poverty, began working before I was 10 and even with all my hard work wasn’t able to come up with the money for college, nor did I ever experience any advantages people try to associate with being white. I am the product of many nationalities yet through an accident of how my chromosomes came together to determine how much melanin my skin would have I have been made to feel ashamed of being white. I have been looked down upon, ridiculed and harassed over the color of my skin, something I never had a choice in. I have never treated anyone with disrespect or hateful behavior because of their skin color, accent, nationality, gender or social class yet I experience disrespect, rudeness, dismissal and condescending behavior towards me all the time and no one ever worries about offending me. I think our societies biggest problem is not necessarily the color of people’s skin but rather the rising need for an increasing number of people to cry foul when they aren’t handed the world on a silver platter, please don’t get me wrong I absolutely believe there are people who are extremely disadvantaged in our country who definitely do need to be lifted up and placed on a level playing field so they can have the same opportunities as the majority of Americans. My concern is that our University, social and political institutions and our country, in general, avoids the trap of the “mob mentality” where one group of people is vilified for an accident of birth and misperceived privilege. Eric, no one said that white people don’t have their own problems to deal with, and no one said that all white people are rich and privileged. However, it is also true that it is much harder for a person of color to achieve the same goals that a white person can. The reason why these posters are offensive is because they are trying to convey the idea that we shouldn’t say “black lives matter” or stand up for injustices that people of color have to go through everyday. No one said that white males don’t have to work to go through college or that it’s easy for them to get scholarships, but look around the U: who do you see in the majority of students? Is it African Americans? Is it Latinos? If you said yes to that question then I consider you take a close look at our student body. It is much harder for people of color to even get to the U, because there is a disproportionate amount of them that don’t even see college as an option. If they can even afford it, they might be able to attend community college, but it is especially harder for them to arrive to our “flagship institution”. It’s simple: you can’t aim for what you can see. People of color start off this “race” to college with a much greater disadvantage than whites, and thus have a much harder time achieving the same goals. So I doubt any of them are taking your scholarships, because they aren’t even applying to the U, or the majority of them anyway. So, are we to assume that it is not okay to be white? I think I agree with the flier, but I would add, it’s okay to be any color skin. I can relate with any frustrations that might be behind the fliers motives. I’m a white male on campus who is under privileged(super poor, parents are poor) it feels like there are many programs to help people who are not white males, so I am excluded. I feel that giving special priveleges based on skin color or gender doesn’t cure society of bias, it just shifts it against a different group. Maybe white males deserve to be excluded (our turn) but I never personally excluded anyone based on gender or race, so I feel a little hurt. That being said, the flier doesn’t help us get rid of racism. It is not okay to be green-skinned. If you are, get thee to a hospital forthwith. So… this could be misunderstood by many readers that the U doesn’t think it’s okay to be white. It probably would have been more effective to ignore them or silently remove these flyers instead of making an open declaration against this act. The actions of the masses are exactly what the blogger had predicted (as reported by the Washington post link above). The U did exactly as predicted and have thus ostracized the white community, especially since a number of students may not have been aware of the intent behind the message and perceived it differently– as an inspirational cause instead of an act inciting discord. They technically also acted against the constitutional right of free speech (although I’m sure there are regulations regarding what can actually be spoken or published at a college campus as Nelson claimed). What was the logical reasoning in these actions exactly? Because from where I’m standing, it looks like you did exactly as an alt-right blogger planned. I also want to chime in. It’s ok to be a human being. This constant focus on race by individuals/the media is more harmful than good. We are all important! If this was a part of a coordinated campaign to sow division and stoke racial tensions, I would think a more pointed approach would be chosen over a a poster with a straightforward statement and no mention of a website, social media handle, sponsoring group, etc. I would say I’m disappointed, but I’m more confused at the response. Is there something I’m missing here? Would posters with similar statements about born traits like “It’s okay to be epileptic” or “It’s okay to be brown” be met with a similar response? I think the Office of Equity and Diversity should reconsider their response to such an innocuous statement. I can understand the motivation to promote diversity and nip potentially divisive actions in the bud. But condemning such an innocuous statement makes it seem like they oppose the idea that it is not “okay to be white” (which I hope is not the case). If someone had posted posters saying “it’s okay to be black” would the U be reacting in the same way? it almost sounds like they feel threatened by diversity in this school, which by the way isn’t that diverse its 70% white. why do you, the majority, feel the need to reassure everyone? this posters just show that white people want to be oppressed so bad and to feel like they’re actual targets of racism. take a good look at the world around you, I can assure you that “racism” towards you is the least of your problems. It’s shocking how many of the commenters above just don’t get it. “White” as a classifier has always been used as a tool of discrimination to divide people. Irish, Italian, German, all of these ethnicities were considered at one time to be “not white”. While I am proud of my English ancestry, I think being proud of being white, which since it’s inception has been full of racial supremacy and oppression of many groups, is not something anyone should be celebrating. It’s abundantly clear that the University of Utah thinks that it isn’t okay to be white. Especially when classes are being taught on campus about “white guilt” and “white privilege”. This only serves to increase division and indoctrinate a new generation. So it’s not okay to be white? This is pretty disgusting that the equity and inclusion office says this is somehow created to cause division. It’s pretty hypocritical and revolting to see racism coming from people who are supposed to work on fighting it. This isn’t some statement of white supremacy, this isn’t racial slurs towards minorities, there’s not even a single message of hate in this. This is when your SJW ideology has gone too far. When you see racism in everything and when you think “it’s okay to be white” is a racist message. You have problems people. And I voted for Bernie Sanders in the Primary and Hillary in the General. I lean left. But this.. what even is this? Coming with the Modus Operandi of the people who wrote this and support this, I bet my comment will be deleted. Because at a school, censorship is the name of the day, not freedom of speech or speaking truth to power. This kind of reactionary response is a joke. Here’s what the “Equity and inclusion” office could have done. Instead you play right into the right wings hands by issuing this kind of reactionary response like you did above. And it’s also legitimately racist. I don’t care how some people with an agenda define racism. Racism is being defamatory, discriminatory or hateful over someone’s race. That’s what it is. I’m disgusted to be a student of this school at the moment, and as I said, I lean left. It could be an attempt to create division yes. But the people posting these should ask themselves, “When was it ever NOT okay to be white?” In fact, when was it ever not okay to be of any race or ethnicity? It wasn’t, though throughout history (white) people made several races feel that way. If you’re white (I am) face the facts: You are not discriminated against, you’ve had the social upper hand for thousands of years, you don’t get to celebrate overcoming racial injustices, they never took place for you. Of course it is okay to be white! But these signs are loaded with a lot more meaning than just the words printed. If you take the time to dig a little deeper (the Washington Post article referenced above is great, or explore a little bit online about 4chan) you learn that the posters are deliberately designed to polarize and alienate students. Without a background to the issue some of the statements in this article can come off brusque. It’s okay to be white, but it’s not okay to use our campus as grounds for a twisted social experiment. Am I the only one who thinks the name “Presidential Anti-Racism Task Force” is something a 3rd grader came up with? Like who was in charge of coming up with that name? How about “It’s just okay to be white”? Would that pass approval by the University Politburo? I feel like the response from the U is weak and lacking explanation. I’m white and when I saw this I didn’t think it was a big deal either. Apparently though it started as a white supremacist movement that whites are under attack. I feel like the U could have addressed this and also mentioned that of course it’s ok to be white as it is to be any race, this is divisive however because it specified being white, and as such implied that other races think it’s not ok to be white or white people need to be comforted because they are being torn down by other races. While I understand that this COULD be part of a some kind of racist campaign… the IMMEDIATE dismissal of this as anything but is greatly disturbing. It really drives home the point that, in the University’s eyes, it is NOT OK to be white. I have to say, I’m starting to greatly consider going to another university. Hello, fellow east-coaster! Don’t fret! I can point you to the classes where you learn about how great it is to be white, if that is your concern. This political correctness campaign is ridiculous. Society should respect all, grovel to none. Instead, there is a default of dividing peoples by social heartache where everything is offensive. As painful as it is to accept, in a classroom of minorities, I’m automatically perceived as a triple uh-oh: White, male, straight. Individual-circumstance goes right out the window, and this “white-privileged male” is treated as a problem. At the end of the day, I’m where I am because I earned it. It’s time to acknowledge differences as strengths instead of an excuse to put one group down in hopes of elevating another. If people are posting these images, then they obviously hurt and need a voice. I agree with the U’s policy of limiting flyers so that other people can speak. However, I’m also concerned about the idea that in order to make minorities on “equal” footing, the white man has to be taken down. It is okay to be white. It is not okay to have a sense of superiority because of your race or gender. So why is the University trying to avoid this conversation? Let’s be real, if a white person went to the Office for Equal Opportunity and Affernative Action to report acts of discrimination against them, they would automatically be looked at like they’re insane and laughed out the door without a second thought. It’s insane these people don’t see their horrendously obvious hypocrisy. “It’s okay to be white” is clearly someone’s effort to decry what they perceive as being treated unfairly based on race. White, Heterosexual males have indeed been demonized by academia and the media. At least many people feel this way. They feel disadvantaged because of their…race… This statement by the University is humorously contradictory. They are attempting to coddle people who are too weak to read a sign that is so minutely offensive and at the same time, claim they are preparing people to live in the adult world. This kind of statement along with the statements the president of the university keeps sending to our email inboxes, speaking to us like little snowflakes, make me slightly ashamed to be a Ute., but, still,, Go Utes! Slogans like “all lives matter” and “it’s okay to be white” are diversion tactics. Movements like Black Lives Matter attempts to raise awareness about systematic oppression by the united state legal system. Those who respond to this movement with “all lives matter” are either missing the point or trying to dismiss the issues that Black Lives Matter highlights. The same is true for these “it’s okay to be white” posters. It’s not untrue that it should be okay to be white, but its counter productive to shift the conversation away from the very real disadvantages faced by people of color. When Eric remarks that “‘Equality’ doesn’t seem so equal from [their] point of view”, its because things aren’t equal. The point of Affirmative Action, and many scholarships IS to give preferential treatment to people of color. The reason that this isn’t “reverse racism” is that the preferential treatment aims to help rectify the pervasive societal disadvantages that plague communities of color. The end goal is equality, but before there can be equality there needs to be a level playing field. Posters that say “it’s okay to be white” actively resist the efforts of offices like the Office of Equity and Diversity. The subtext of the poster is therefore, “it’s okay to ignore racism”. It’s okay to be white, but it’s not okay to shift the conversation away from people of color. White people aren’t the victims, it’s not good to act like they are. Our school’s idea and handling of “diversity” is what’s creating a divide. Obviously, some students on campus are feeling pushed out, so why not invite a discussion or take an anonymous opinion poll instead condemning those who felt the need to post these fliers? It is ok to be white. Can someone please tell me if it ok to be white? · if I become a politician, I’ll try and disenfranchise a minority. · if I become a banker, I’ll steal everyone’s money. I’m honestly not angry. Just kind of bummed out. To all who have commented in this article, but mostly to the University, please THINK about things before jumping to conclusions. This article and these posters can be taken many different ways and many valid points have been made. Before making a point about these posters, please think of all views and ask why these posters are up? It could be to cause division, but it also could be a call for help for whites they may feel discrimination towards them. Either way, think first.. Then make a statement. The attached short speech will help. Please watch the clip. There’s nothing wrong with what the poster says, though in the current societal context its a supposed jab at movements that would say otherwise. Though there is truth to this snarky attack, it is in the end an attempt by 4Chan to troll and cause division and can hardly be seen as sincere. Anyone who thinks that “It’s okay to be white” is hereby directed to enroll in the indoctrination classes recommended by the equity office, as offered by the university of your hired education facility. You obviously have no idea how evil and oppressive your 10th great grandfather was, and thus, how evil and oppressive you are, because you carry his tainted genes. You will be assimilated and made to feel shame for whatever injustice your betters have determined will make you personally subservient and culturally suicidal.